The 2016 election will take place in less than three weeks. For the most part, issues have been buried under an unending pile of personality discussions and accusatory character detraction. Occasionally reporting of the campaign has strayed into substantive matters, but those, too, have been largely limited to a few wedge issues and dog-whistles about trade, war, immigration, and social policy. There is one topic, however, which may be as important as any but has received no significant attention. Regular readers of my blog may suspect that I am referring to an environmental issue, most likely climate change. They would be right. It is easy for most observers and voters to say we have more pressing matters to attend to. The risks associated with climate change are perceived to be far in the future and unrelated to any critical issues facing us today. Those observers and voters would be wrong. In a post nearly a year ago I delineated some of the present and immediate connections between climate change and such events as the war in Syria. This is certainly not going to end without drastic action, since higher temperatures lead to both droughts and mass migrations out of areas that become too hot to live in. The fact that the regions most vulnerable of to this sort of devastation are those where massive amounts of oil are located (and thus are at the crux of all the political and social instability thereby entailed) presents more significant and immediate danger. Climate change, as I have noted before, is connected to almost every other major issue confronting the modern world –not excluding the USA and our upcoming election. This is the election which will decide our course on this vital matter. 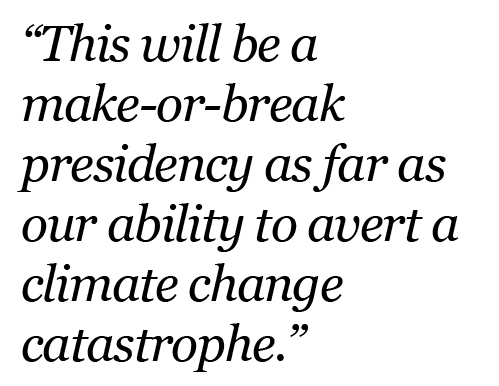 US News – hardly a cell of granola-munching tree-huggers – said so over a year ago. Present crises and controversies over war, immigration, and natural resource control are not the only such issues. Social and religious concerns are connected, too. Climate change havoc will be visited disproportionately on people and places already scarred by poverty and powerlessness, such as the recently hurricane-struck Haiti and low-lying island nations such as Kiribati and the Maldives. Do matters of health care and maintenance figure in your political decision-making? Then you must be thinking of the expansion of the tropical and sub-tropical diseases that are part of life in the warmer parts of the world – Zika, dengue fever, chikungunya, yellow fever, and other illnesses are spread by mosquitoes whose territory is expanding as temperate areas become warmer. Malaria, which kills more humans than any other disease, could return to the American mainland sometime soon. How about energy issues? The American Petroleum Institute has been pushing its own agenda by a series of television ads asking, “Are you an energy voter?” and suggesting that continued large-scale oil exploration and exploitation is the answer to future energy needs. As my frequent subject (and my friend) Xiuhtezcatl Martinez – celebrated in the October 17, 2016 Time magazine Next Generation Leaders feature as “Plaintiff for the Planet” – has pointed out, our future does not lie in a hole in the ground. Alternative energy sources that do not add to greenhouse gases will (indeed must) be the source of the energy boom of the next decades. It is a sad commentary on the state of our political discourse when half of our nationally-balloted presidential candidates (one of the two major-party candidates and one of the two minor-party candidates) do not care a whit about climate change. Donald Trump, standard-bearer of the Republican Party, has said repeatedly that he believes there is no such thing as man-made climate change. Although he is clearly not an expert in the field and does not believe those who are, Trump is convinced that he understands the climate change issue better than anyone else. Gary Johnson, presidential candidate of the Libertarian Party apparent knows virtually nothing about the Syrian Civil War, which is profoundly and inexorably connected to climate change (he was stumped by a question about Aleppo, the largest city in Syria and site of the war’s greatest and longest battle). Worse yet, when asked about his position on climate change five years ago , Johnson gave the most irresponsible, fatuous, and cynical answer ever: it doesn’t matter. Since “in billions of years the sun is going to grow and encompass the earth,” what difference does it make? The planet is going to get very warm in billions of years, so why care about what’s happening now? Johnson’s take on climate change is unacceptable, as is Trump’s. The Democratic Party and Green Party have candidates and platforms that address the effects of global warming and promise steps will be taken to mitigate it. Neither is particularly clear about the details beyond grand goals, but if recognizing there is a problem – something which the Republicans and Libertarians refuse to do – is the first step to solving it, establishing goals is the second step. After that we are on our way to correcting things before they are beyond fixing. November 8 is election day. The most salient issue is not who (or whose spouse) is a more boorish sexist, who is the more disrespectful of (fill in your favorite patriotic symbol here), who is the bigger liar, who said the most outrageous thing overheard by a microphone, or any of the rest of that nonsense. We are not electing Homecoming King and Queen. We are electing the person who will preside over our national response to the most pressing matter of our time – what, if anything, are we going to do to avoid a global environmental catastrophe that will disrupt everything in the world? Previous Previous post: POLITICS: RELIGION OR SPORT?